We spent the afternoon on Sunday scrambling up a woodsy mountain side and fording a local creek before reaching the top of the mountain at Sunset Rock. Needless to say, we were famished by the time we made it home. With dinner still a few hours away, EM took over the kitchen and whipped up something amazing for us to snack on. 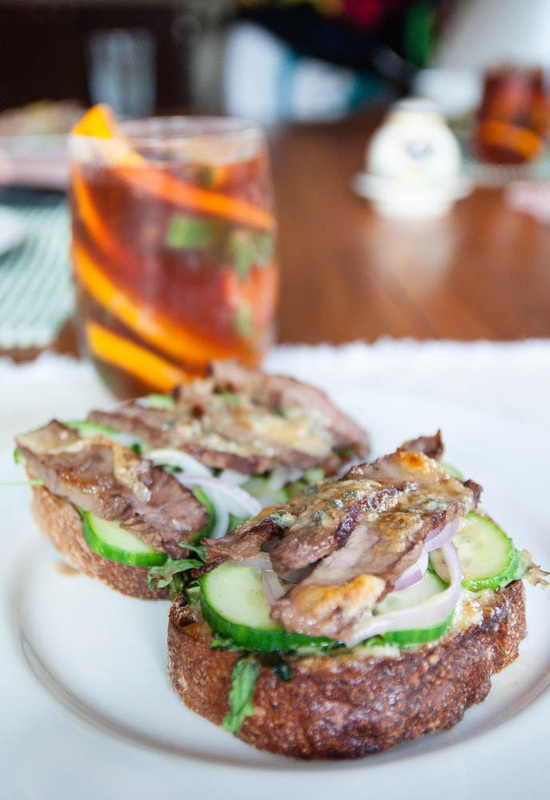 Slices of leftover rib eye steaks topped a tartine of cucumbers, arugula and homemade aioli with jalapeno and thyme. A crumble of blue cheese on top before they went into the oven and a few minutes under the boiler, these were ready to be enjoyed with a cool glass of Pimm’s.